Put your worries to rest knowing there is a crane rental company available for you 24/7 so you can complete your crane rental needs. Having extensive knowledge and a number of cranes at our disposal, we are ready to help you in any way we can. Contact us today and find out why we are the preferred crane company. any time of day with our 24/7 crane rental services. We have the cranes you’ll need to complete any and all projects when you rely on the skilled and knowledgeable team at Network Crane & Rigging Company. As a family-owned-and-operated business, we work hard to provide safety and satisfaction to our customers in Concord, California, the San Francisco Bay area, Walnut Creek, Pittsburgh, Antioch, & Martinez, California. 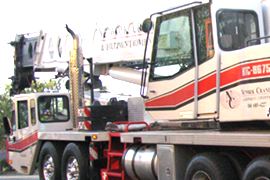 When you’re in need of hoisting heavy equipment, supplies, and more, we have you covered. Trust in us to properly apply over 40 years of experience to your project for maximum results. We can assist you in steel erection and rebar placement for new construction. Anything that needs to go in to build a building, rebar, structural steel, framing lumber, electrical equipment can be accomplished with us. While our prices vary from project to project, we can guarantee that our prices are always competitive and affordable. We believe the crane rental and rigging service shouldn’t stretch your budget. Contact us today to receive a quote and pricing specific to your project. Long-term crane rental work can be quoted separately.